Pets need extra protection in extreme this cold weather - if it's too cold out for you, it's too cold for your pets too! Nassau County, NY - January 23rd, 2014 - With sub-0 wind chills expected today, the Nassau County SPCA urges pet owners to take extra precautions to keep their families and pets safe. Temperatures are in the single digits now and are predicted to plummet back into the single digits again overnight into Friday. The National Weather Service has predicted wind chill values of 0 to 10 below zero. The Nassau County SPCA is asking all pet owners to make sure to limit their pet's time outdoors and to bring pets that are normally kept outdoors inside, this includes outdoor cats. Prolonged exposure to cold results in a drop in pet's body temperature and hypothermia. Frostbite can also occur in pets to the parts that are the most exposed and least protected by fur. It often accompanies hypothermia. Frostbite tends to involve the tail, ear tips, pads of the feet, and other exposed areas. Think about how we would behave tends to be a good rule. If we don't want to go out and expose ourselves for a long period of time to the cold because of the risk for hypothermia and frostbite, we wouldn't want to do that to our animals, right! 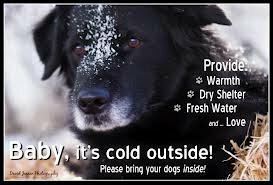 So please protect your pet during this cold snap! It is time to take special precautions to make sure animals are protected against the cold, so here are some cold weather pet tips. Subject: LongIsland.com - Your Name sent you Article details of "Nassau County SPCA: Please Bring Your Pet Inside"